If you're a fan of history, are intrigued by Scotland, Highlanders, and the paranormal, and if you enjoy a touch of humor with your romance, you’ll find it all within the pages of my award-winning novels. 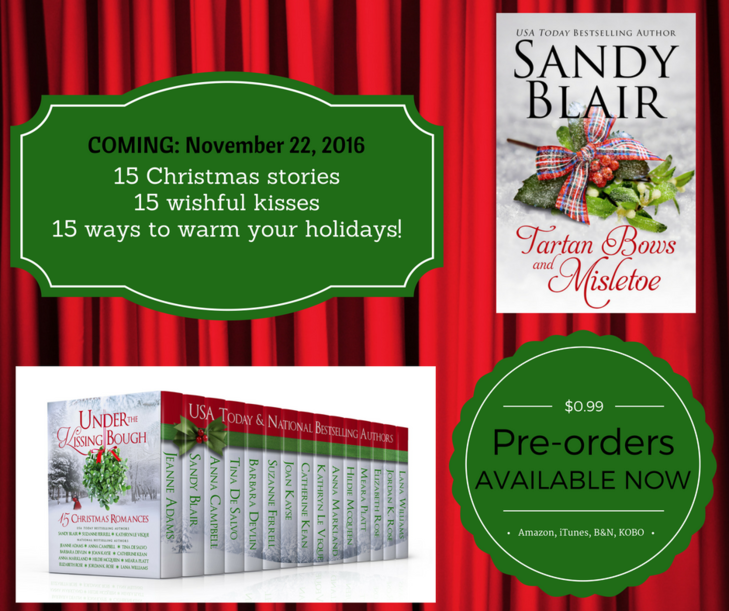 I love hearing from readers and can be contacted at the Contact Sandy page and I’ll respond as soon as possible. Also subscribe to my newsletter so you don't miss any news about my books, fan club, appearances, workshops, and so much more. There is a link to subscribe on every page, similar to this one to the immediate left. Thank you for visiting my site. I hope you enjoy the new look, videos, Photo Gallery, and Fun Stuff pages designed by the very creative Sandy Marlow at Phoenix Video Trailers & Banners!! Now roam around and have fun! 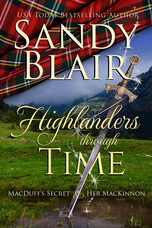 Still Available - Highlanders Through Time! Your privacy is very important to me. I do not store any personal electronic data beyond your name and email address when your request my quarterly newsletter, which you may discontinue at anytime by requesting we erase your name and email address from our file. I will never use or share your information with an outside party for any reason. bYour privacy is very important to me. I do not store any personal electronic data beyond your name and email address when your request my quarterly newsletter, which you may discontinue at anytime by requesting we erase your name and email address from our file. I will never use or share your information with an outside party for any reason. I’d love to meet the Long Island Medium. Since marrying, I’ve moved 27 times. Seriously shiny, tricked-out Peterbilt 18 wheelers make me smile. I get giddy harvesting veggies from my garden. Dirty baseboards and light switch plates drive me crazy. You’ll find real butter in my refrigerator. I worry about the weather…a lot. Swimming makes me happy, jogging does not. I’m named after my mother’s beloved childhood pet, a buff-colored Cocker Spaniel. I’ve fallen in love with every hero I’ve written. I’ll straighten a crooked picture no matter where I am. I think Texas Big Hair should make a comeback. My hips will look smaller. I love Zippo’s Special pizza, hold the peppers. My go-to-comfort foods are chocolate turtles and chicken noodle soup. I don’t have a maid or assistant, although I’d love to have both. Computers and high-tech cell phones intimidate me. I gave birth to big healthy twins in 50 minutes flat, start to finish. I hold the record for killing houseplants. I don’t color my hair. I earned every gray strand. Your privacy is very important to me. I do not store any personal electronic data beyond your name and email address when you request my quarterly newsletter, which you may discontinue at anytime by requesting we erase your name and email address from our file. I will never use or share your information with an outside party for any reason.